Whether you want to explore colorful reefs, climb through massive natural rock formations, or just relax at one of the many famous beaches, On the Sea catamaran charters can take you to both lively and secluded locations throughout the United States and British Virgin Islands. Our captains have years of local knowledge and are looking forward to sharing their secret spots with you and your family and friends. Hike through the world-famous Baths of Virgin Gorda, visit Norman Island to party on the infamous Willy T, island hop to Jost Van Dyke to check out uninhabited islands like Sandy Spit, or tour a rum factory on Tortola. Our captains will help you customize your day on the sea to make sure you have the most memorable day of your vacation. Snorkel some of the most beautiful reefs in the Caribbean. Our captains are experienced divers and know how to find the best places to see tropical fish, sea turtles, sting rays and other sea life at some of the best snorkels spots like the Caves, the Indians, Waterlemon Cay and Turtle Cove. 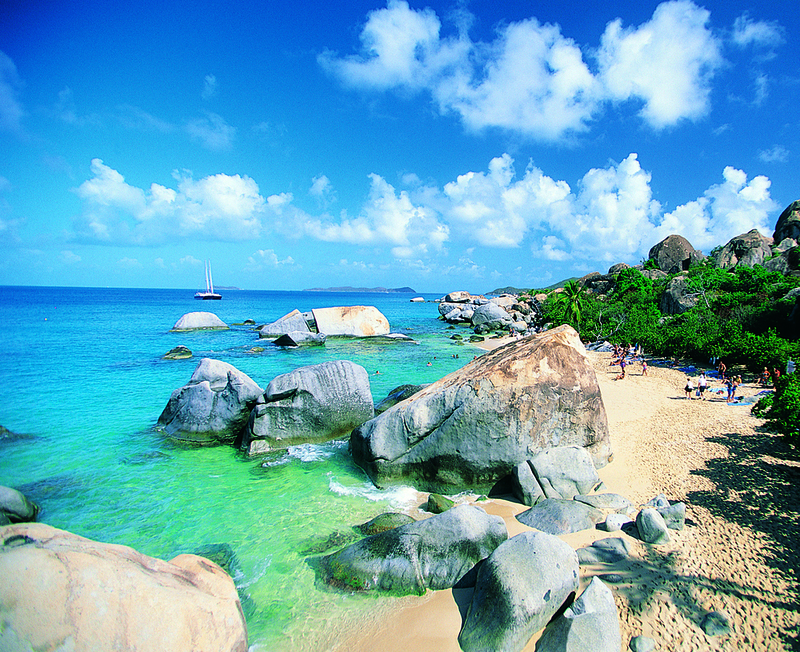 Visit some of the most pristine beaches in the world. Enjoy lunch with your toes in the sand at one of the Virgin Islands' well-known beach bars like the Soggy Dollar Bar, Bee Line, Pusser's at Marina Cay or Sopper's Hole, ABI, One Love, Ivan's Stress Free Bar or Pirate's Bight. We offer competitive rates for your private boat trip. Our Catamaran, "9 Lives," has lots of seating and can accommodate up to 8 passengers comfortably. Pricing is based upon 6 person charter. Please add $50 per person over 6 people. Ryan was born and raised in sunny Florida. A true water baby, he started swimming at two months old. His college internship from Florida State brought him to the Virgin Islands, where he fell in love with the island life. The rest is history. When Ryan isn't showing his guests around on the water, he can be found underneath the surface. He is a SCUBA instructor, proficient spear fisherman and naturalist who loves sharing his knowledge of the sea. Born in St Thomas, Antonio grew up on boats with his father. He started his professional maritime career in 2006. It has taken him from charter boats in the Virgin Islands to commercial fishing in Alaska and Washington along with tug boats in Hawaii. Antonio is an avid free diver and lobsterman who enjoys being in the water both on and off the clock. With endless stories, some of which are even true, Antonio loves sharing his backyard with all of his guests. Can't say enough great things about Ryan or his boat! We had an amazing day. Ryan is a fantastic captain, and his boat is pristine. Highly recommend his service if you are considering a day on the water in the USVI's or BVI's. We had several people, on multiple boats (different companies) traveling together, and Ryan worked hard to accommodate all. His flexibility and service was above and beyond. When it was just the Dad's we had a great guys experience. When the kids joined, it turned to a fantastic family adventure. Ryan went out of the way to make sure the kids were safe and had a great time! Additionally, he was very knowledgeable, with lots of interesting stories about the history and lore of the islands. Final word... this is a great choice if your looking for a fun day on the water. Like Us On Facebook, Share the Love.